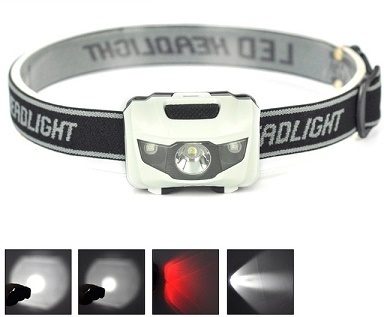 2-in-1 LED Headlamp: White LED and Red LED light. 100 Lumens. Includes 3 x AAA alkaline batteries. 4 modes: Bright White, Low White, Bright Red, Flashing Red. Lamp has 4-position tilt. Head strap is fully adjustable. 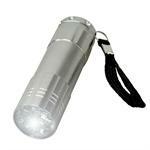 Provides long-life operation from 3 x AAA batteries. 3-in-1 LED keychain light. Has RED laser, Ultraviolet LED light, and White LED light. Includes batteries. UV9LED: Ultraviolet high-power LED light. Includes batteries! UV9LED: Ultraviolet high-power LED light. Includes batteries! Size: approx 3.5" long x 1" diameter. Runs on 3 x AAA alkaline batteries (included). Excellent UV light for detection activities. 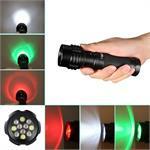 3-Color LED flashlight: White, Green, & Red LED, all in one flashlight !